MI6 Competition: MI6 has teamed up with Out Of Print to give lucky readers the chance to win Ian Fleming Bond teeshirts. Out of Print, the tee-shirt company specialising in literary gems, has released a unique line of clothing for 007 fans. 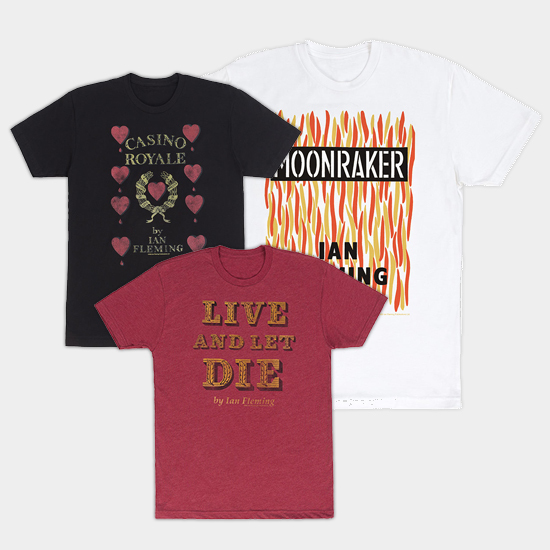 The three new designs feature covers from the first three Ian Fleming James Bond adventures: 'Casino Royale', 'Live And Let Die' and 'Moonraker'. All three covers are based on the first edition Jonathan Cape covers, designed by Kenneth Lewis with consultation with the author. All of the designs are officially licenced by Ian Fleming publications and come in sweatshirt, women's, and unisex cuts and are priced from $28. In what year was Fleming's first James Bond novel (Casino Royale) released? Terms & Conditions: THE COMPETITION CLOSES AT MIDNIGHT GMT ON 17th APRIL 2017. MI6 WILL CHOOSE THE WINNERS AT RANDOM FROM THE CORRECT ANSWERS RECEIVED. THE WINNERS WILL BE CONTACTED VIA THE EMAIL ADDRESS SUPPLIED AND THEIR POSTAL ADDRESS WILL BE REQUESTED. IF A WINNER FAILS TO RESPOND WITHIN 7 DAYS OF PRIZE NOTIFICATION, ANOTHER WINNER WILL BE CHOSEN UNTIL ALL PRIZES ARE ALLOTTED. COMPETITION IS OPEN TO MI6 READERS WORLDWIDE. ENTRANTS MUST BE AT LEAST 13 YEARS OF AGE.